As term 1 hurtles towards its end parents may be thinking about booking a short holiday during the break. At least, that’s what we do. Invariably we spend time umming and aahing and not going anywhere, but, miraculously, last October saw us head up to the Riverland for a few days away before school went back. Not having done really anything in the way of road trips, we were anxious to choose somewhere that was not too far away and I had a Discovery Parks membership that I had won that I was keen to use. Because Andy and I prefer not to go to bed at 7pm, it was essential also to choose accommodation where we had two separate bedrooms. 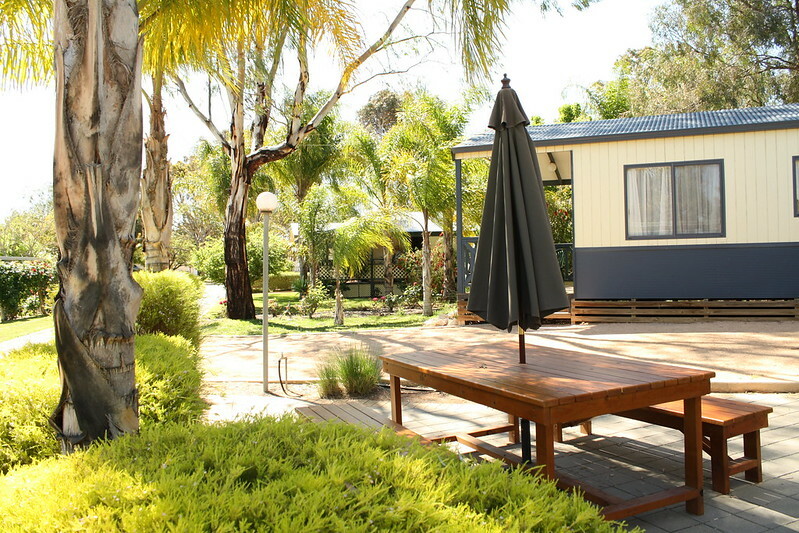 Our really positive experience at the Port Elliot Big4 in 2015 pretty much sealed the deal, in terms of heading to a caravan park and splashing the cash for a two bedroom cabin. I’ll wrap up some other useful hints and tips for Barmera in another post. This one – all about the park itself. The name gives it away, that the park sits on the shores of Lake Bonney. This means that there are plenty of water-based activities available – there are water trampolines and various water sports equipment to hire and if boating, fishing, waterskiing etc etc are your thing then you’re well catered for. The park also has a swimming pool – and despite the weather not being ideal for swimming, Master 5 made sure we checked it out. For children there is a playground, a jumping pillow (this appears to be a KEY piece of equipment in terms of how good a holiday you have) and there is also a games room, with a pool table, air hockey and a couple of video games. Despite the fact we were there in October when you might expect some sunny weather, we had one very damp morning and playing a couple of games of pool as some down time was just perfect! The park itself is home to quite a few static caravans and (I’m guessing) permanent residents. Some of these residences have really beautiful, well maintained gardens. 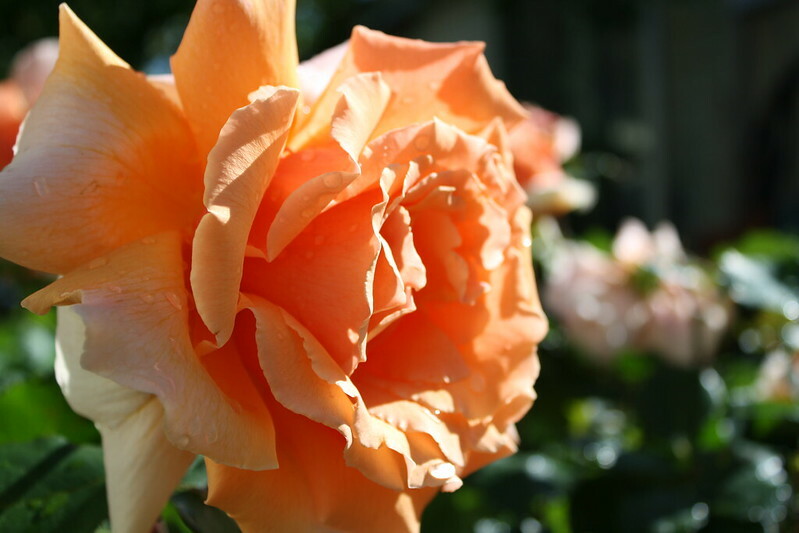 Nearby Renmark is home to an annual rose festival and many of the static caravans had absolutely stunning roses. Clearly, there is something very special in the soil in the area! Besides looking good, this helps the park look really well maintained. We stayed in a ‘standard holiday unit’ – and while I took photos of the interior, you’re better off looking at the Discovery Parks website because they’re better quality photos (there’s a surprise!) and they are totally true to what you get. Yes – the interior is a little beige and feels a little 1970s, but our unit was very clean and (critically) the shower was hot with good power. Seriously – all I need for a holiday to be good is a hot, high pressure shower and a clean space! The park is reasonably close to quite a busy road and our cabin was on the road side of the park. We’re pretty heavy sleepers so the odd noise of a truck going past didn’t bother us but if you are a light sleeper, I suggest you look at a park map and choose accommodation closer to the lake (I think if you’re camping you’ll be OK on that count anyway). Each of the cabins has an outdoor setting and it was really lovely at the end of the day to sit outside, have a drink and chew the fat. There are onsite bbqs which is great if you want to have a night off dining out without resorting to cooking a serious meal inside the cabin. I recommend reading the welcome manual as we thought we had to feed the BBQ 20c pieces and only discovered after the fact that they’re actually free! Crucially, the staff at the park were really friendly and offered good advice when it came to both coffees and evening meals. We really enjoyed our break at Lake Bonney and while I probably wouldn’t want to be there in the height of summer (or, indeed, in the depths of winter), I think it makes a perfect destination for the break between terms 1 and 2 and that between terms 3 and 4. 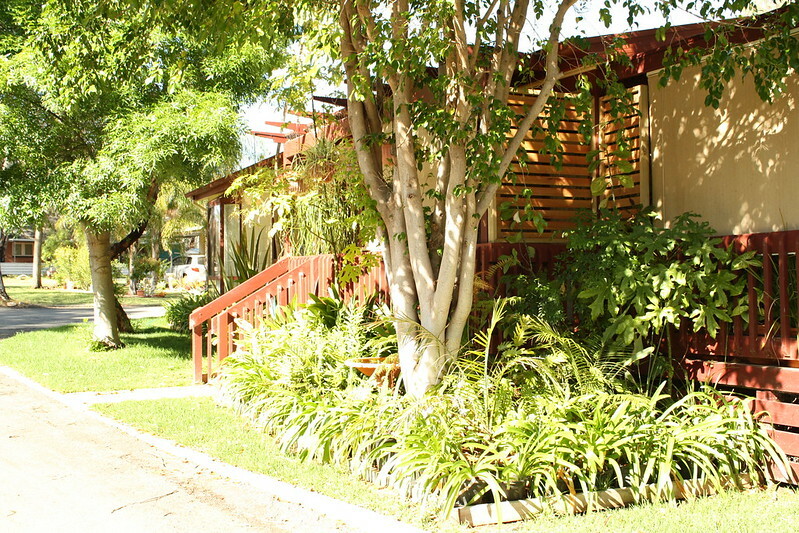 If you’ve been on other great short breaks in SA (that can fulfil our two bedroom requirement!) let me know in the comments as we’re determined to take the time to explore a bit more of our state!